Flip Teaching interfuses educational content demonstration through web presentations and engaging activities with students in class. It delivers knowledge to students with online presentations as well as home assignments and tasks. Teachers help students after they try to solve the problems themselves. Pedagogue can be attentive towards all the students individually and students can help each other thus making class time for hands-on work. Flipping the classroom also allows teachers to contribute more time to students’ individual needs and provide more tailored education. The implementation of iPad changed the traditional, old-fashioned teaching practice and can contribute enormously in a flipped classroom. IPad can help student access subject knowledge in less time and deal with the problems arising in the classroom during a lecture. In a flipped classroom, no students can hide themselves and sit idly; they have to work with their fellows. The ability to characterize learning is being emphasized with introducing of iPad. 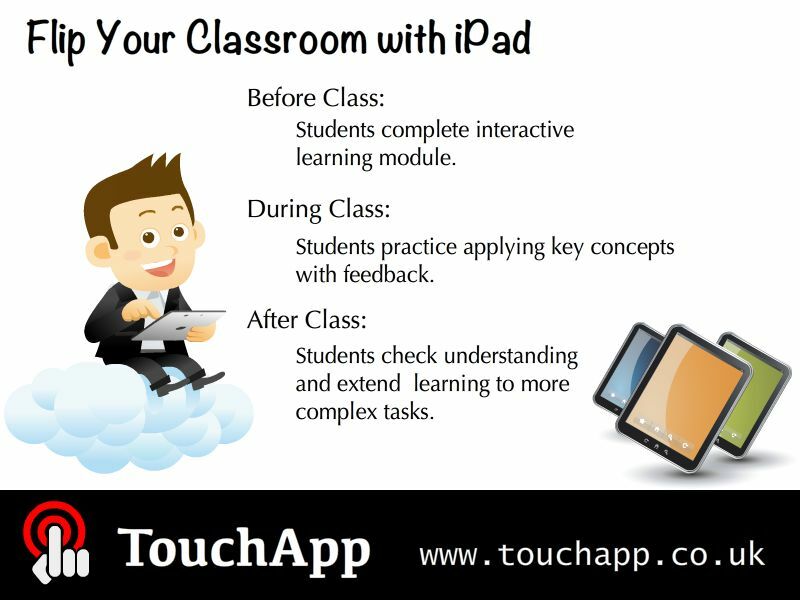 In the flipped iPad classroom students learn the lessons at their best suitable time and location. With the paused-recording-setup, writing, typing, finding images, drawing diagrams, loading web pages comes on demand thus allowing students to focus during the face-to-face class. The students can discuss the problems and solve the issues amongst themselves in the online class forum; the feedbacks from the teachers and comments from classmates or parents are possible. For each discipline, it will be less about sitting-and-getting and more about learning by doing. Before using iPad for flipped learning, some preliminary things you should carefully consider and get familiar with the techniques. It is crucial to provide engaging learning objects for students to consume at home in order to acquire content. You can either acquire high quality off-the-shelf content from Apple education Store, such as the science app “Focus on Plant” from TouchApp; or you can create your own teaching materials using flip teaching support tools. For example, iPad app “E-Lecture Producer“ can help you to recorder and publish voice-over PPT online. From a technical perspective, you should always grasp the basic before starting your iPad journey, understand how to ‘Transfer files from a computer to iPad’, ‘Display or Mirror your iPad screen on an external projector’ and ‘Tablet security concerns and solutions in the classroom’ etc. General iPad tools are available to help you manage classroom, interact with students and improve education outcome. Flipping is an erratic method for a teacher towards a more focused classroom but it is a great bridge between the teacher and learners with innovative ideas. Still in its early stages, flip teaching with iPad definitely requires time for its consolidated use in project-based learning, challenge-based learning and getting appreciation by a large community.